Headfort's Brendan McGovern is alone in second and just three shots off the lead as he chases his maiden European Senior Tour win in the Travis Perkins Masters at Woburn. The Headfort professional carded a second consecutive 70 to get to four under par as American Clark Dennis fired the lowest round at the Travis Perkins Masters since 2012, a seven under par 65, to get to seven-under par. “I’m happy with that,” said McGovern, winner of this year's Q-School, after a birdie-bogey-birdie finish. “I had a good finish with a birdie on 16, and I hit a good shot into the last. Even though it was a short putt it was difficult. Texan Dennis earned his European Senior Tour card at the Qualifying School in February and quickly made a move as he birdied the first and fifth holes to make the turn two-under. Gains on the 11th and 12th holes were followed by birdies on the 14th and 15th holes, before making his seventh of the day on the 17th. “No bogeys around here is a feat,” said Dennis. “It’s difficult to go around this course without a bogey. I putted nicely, and drove the ball well, which you have to do here. If you drive the ball well you can shoot a low score, but it’s still a challenge. “Yesterday, I was a couple over with a few to play and birdied 16 and 17 – so I was pleased to get in at level par. This is the kind of course where you are never comfortable. You can get into trouble on every hole, so you have to be really aware of what you’re doing. Despite shooting the lowest round at this tournament since Mark James’s second round in 2012, Dennis is not getting ahead of himself. In a share of third place are former Ryder Cup player David Gilford, 2003 HNA Open De France winner Philip Golding and 2011 Senior Tour Number One Peter Fowler on three under par. Eamonn Darcy is tied 22nd on four-over after rounds of 76 and 72 with Des Smyth, who became the second Irish winner of the title in 2010, tied 35th on six-over after rounds of 74 and 76. Des Smyth carded a six under par 66 to take a share of the lead in the Travis Perkins pls Senior Masters at Woburn.Des Smyth carded a superb six under par second round 66 to take a share of the lead in the Travis Perkins plc Senior Masters at Woburn Golf Club. Colin Montgomerie is in control at Woburn. 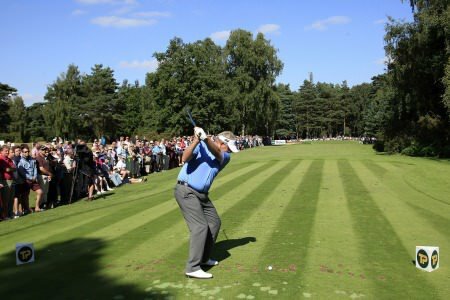 ©Getty Images.Two double bogeys proved costly as Philip Walton slipped six shots behind Colin Montgomerie ahead of the final round of the Travis Perkins plc Senior Masters at Woburn.